For keen chefs at home and in the workplace kitchens are a sanctuary where the best tools and equipment bring their skills to life. Celebrity kitchens offer up a constant source of inspiration and envy to those watching them either whip up a dish on the TV or having a peek around a home backed by plenty of investment in the very best kitchen gadgets. It will come as no surprise that most of those immaculate top-spec kitchens featured on television cookery shows are in fact studio sets purpose built for whipping up fantastic creations and striking envy into the hearts of viewers. Although real houses are often used repeatedly for television cookery shows, with this one having been used by Joe Wicks and Jodie Kidd. While celebrity chef Nigella Lawson meanwhile does use a studio kitchen but reportedly models it on her own kitchen at home. It looks pretty authentic and is clearly well equipped. Away from the studios we occasionally get a glimpse of life inside celebrity homes boasting fantastic kitchen facilities. Great British Bake Off favourite Paul Hollywood’s kitchen was featured in the Liverpool Echo when the house was up for sale, showing an impressive kitchen with plenty of space for creating Chelsea buns and bread. The great thing about celebrity kitchens where the owner has a true love of culinary creativity is the combination of style and practicality. After all what is the use of a show-stopping kitchen if it doesn’t actually have the surface space and cupboard capacity to enable you to cook up a storm in the kitchen. Paul’s former co-presenter Mary Berry is another celebrity chef with a fantastically well-stocked kitchen also showing a dedication to form and function. Opening the doors to her kitchen, the celebrated chef even has tips for creating the perfect kitchen – obviously practicality is a major feature. Then, of course, there are the kitchens that you really just have to have a lot of money to install, such as this impressive space that Billy Joel must be delighted to call his kitchen. Getting up to make coffee in such amazing surroundings surely must take the edge off any tiredness! The great interest in seeing celebrity kitchens is that they give us the chance to dream – and start planning how we could make our own kitchens that bit better. 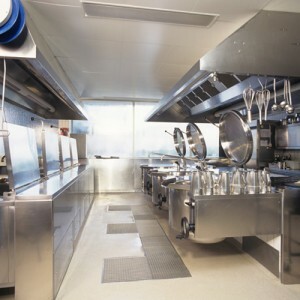 For advice on adding new equipment or designing a new kitchen for your business get in touch with Caterline Ltd.